Harvester are spoiling you! Read on to find out more about the deals. Whatever the occasion, Harvester welcomes you. It's easy to reserve a table with their handy booking tool. If there's no online availability, dont worry. We do keep tables free for walk in guests, so if the date and time you want can't be booked online, please just give them a call. Harvester are all about keeping it fresh and have a brand-new menu for you to sink your teeth into! Get excited, because we are – drum roll please – introducing the lunch menu! From 11:30 am to 5 pm, they’re serving up feel-good salads, wraps, chicken & waffle and so much more, from only £6.99! Don’t forget, they’ve also got deliciously slow-cooked pork belly in a mouth-watering bourbon glaze – but don’t take our word for how good it is. Book your table now and try for yourself! 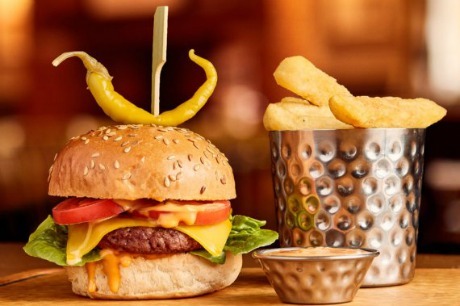 Whether it’s a date night or a mate night Harvester are always looking for great ways for you to enjoy your favourite dishes, so with that in mind they’ve created the new evening set menu to enjoy with family and friends. The evening set menu is available every week, Sunday to Friday, and for just £12.99, you can enjoy a fabulous 2-course dinner or for just £2 extra, you can get a delicious third course and make the spark last that little bit longer. Harvester kicked off 2019 with Veganuary and they're awesome vegan meals that give flavour a whole new meaning have now become permanent additions to the menu. First off, there’s The Purist Burger — nestled between a seeded bun with baby gem lettuce, tomato and a pickled chilli, is a Moving Mountains plant-based patty, smothered with a melting mature Violife slice. If it’s dessert you’re in the mood for —Try the Vegan Sundae Best, their very own vegan take on the much-loved Harvester classic. Scrumptious scoops of vanilla non-dairy ice-cream drizzled with your choice of Belgian chocolate, raspberry or strawberry sauce. Heaven. Harvester care about your little ones’ wellbeing as much as you do. That’s why their kids’ menu is packed with quality ingredients and fresh flavours that make eating fun, no matter how fussy they are. Whether they love to play with their food or they’re always after what Mum and Dad are having, they’ve got plenty of tasty plates to suit all appetites. And with swappable sides, unseasoned veg and unlimited salad, they’ll be well on their way to getting their five-a-day, too. Available all week, served up until 11.30am, Harvester's breakfasts are what mornings are made for. 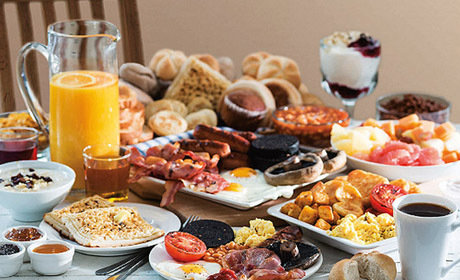 Gather round for a proper breakfast. We've got all your cooked favourites. Plus, every morning our famous salad bar becomes a deck of unlimited continental breakfast delights. Pork sausages, soya & leek sausages (v), back bacon, black pudding, flat mushroom (v), tomato (v),baked beans (v), fries (v), hash browns (v) and fried, scrambled or poached free-range egg (v). Enjoy Unlimited Cooked PLUS help yourself to our continental breakfast bar AND unlimited tea, coffee and chilled fruit juices. Smashed avocado and tomato salsa topped with two poached free-range eggs on a toasted breakfast muffin. Buttermilk-fried chicken, waffles and grilled back bacon with maple-flavour syrup. Try it, it's amazing! 5oz rib-eye steak, fries, tomato and two fried free-range eggs. If the telly's too good to miss, you can always treat the family to a Harvester at home. Everyone's favourites from grills, sauces, salad and sides plus there's no dishes to wash up afterwards - what better way to enjoy a family night in?